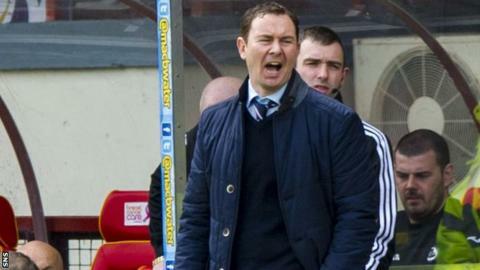 Manager Derek Adams has revealed his immediate future lies at Ross County, after sealing a seventh-place finish in their second season in the top flight. County won 3-2 at Partick Thistle on Saturday thanks to goals from Jordan Slew, Yoann Arquin and Melvin de Leeuw. And, when asked if the club matches his ambitions, Adams said: "Yes, they're a club that is doing well but you wait to see what transpires over many years." Adams led County into the top flight for the first time in 2012. And they secured a fifth-place finish in the table last term. "Finishing fifth last season and finishing seventh this season, for a club of Ross County's stature, it's a magnificent achievement," Adams added. "I'm delighted for the players, it's been a good week with two wins on the trot. "It was an amazing end to the season. All the fans wanted that excitement and we've been able to finish in a very good position again. "It felt more like a pre-season game to start with but then we got the goal, then the second and it all kicked off from there. Partick were able to get back to 2-2 and eventually we got the winner." The Staggies have several players on loan and the manager admitted he will have to spend the summer recruiting a host of new faces. "We'll probably have to start all over again, that's the nature of the business we're in, but they've all done very well for us," Adams added. "I'm delighted for the players who have been here for a while and those who came in in January. "It's great for the football club, the amount of money we've made today is delightful, we moved up a good few positions and to finish seventh is great."